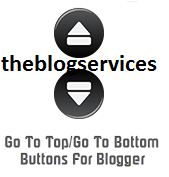 The Go to Top and Bottom Buttons widget can be used to navigate to the top and bottom of the page content, especially when on the main page and there are many articles or when an article has too many comments. There are times when it is difficult to navigate through the blog when traffic is high because of the comments. The tendency sometimes is that you cannot find your comment. And you will need to make use of “find” or “search” boxes in order to do this. Well, if your main concern is about going to the beginning or end of a certain tread, this is a good button for to make use of. These buttons have a fade-in and fade-out effect which means that they will fade slightly when we are scrolling to the top or bottom of the page and also they have the function of going up and down the blog. I advise that you should have this on your blog. Your goal as much as possible is to make it easier for your readers to navigate. Remember, this is not for you, but for them. This is another simple way of avoiding bounce rate in your blog. Note: - in green are some annotations that explains what styles you can modify on their left side. - You can change the arrows by changing the URLs in blue. Note: In case you want to remove the "Go to top" button, remove the 1st bolded code and to remove the "Go to bottom" button, remove the 2nd one. Step 7. Finally, Save your Template. Enjoy!